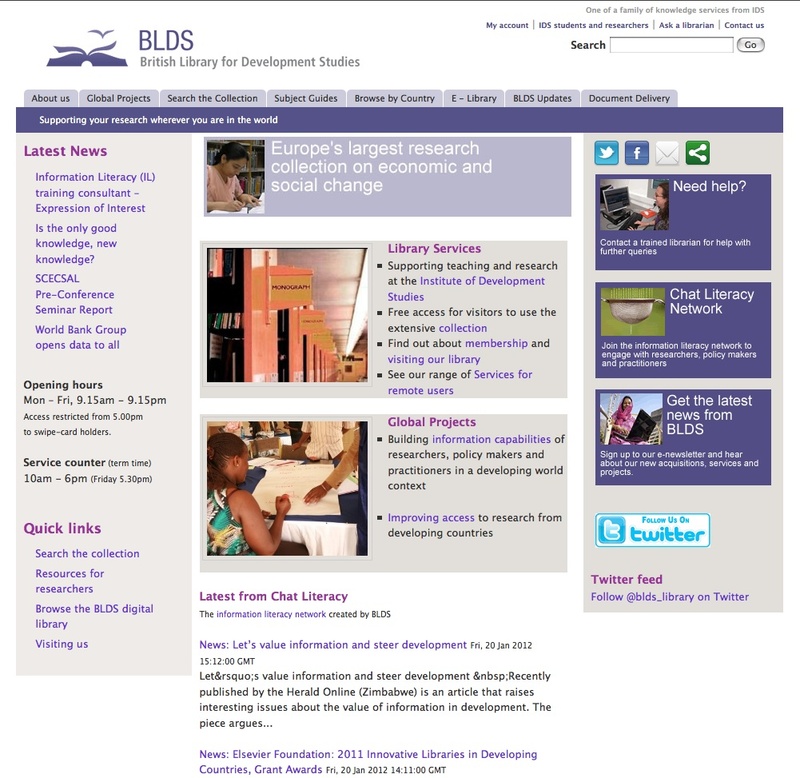 The British Library for Development Studies (BLDS), based at the Institute of Development Studies (IDS) at Brighton, UK, holds a comprehensive research collection which provides access to more than 150,000 records (over 1,000 journal titles, over 10,000 magazines and newspapers, over 80,000 research papers) on many different topics related to developing countries worldwide. It covers material from a a variety of sources, such as developing country governments, international entities, political institutions, NGOs. Among its many online services, it provides full-text of electronic resources (from CD-ROM and journals, to reports and working papers) along with access to records, summaries, references, and a variety of data. Databases of selected websites by subject are also available. The whole catalog is freely available online as well as access to external electronic resources and the e-mail alert service, but a paid membership and other restrictions for non-IDS community apply to access journals, indexes, full text databases and other resources. Different search options are provided, also for specific countries and databases. A series of guides to several resources and services are available in pdf format, along with over 30 subject guides, useful tools for making easier to browse and locate items in this vast collection of material. A simple outline makes navigation simple. The Library Online Public Access Catalogues or OPAC are integrated databases provided with their own search engines. The Library of Congress, the largest library in the world, provides access to nearly 128 million items in 450 languages, many millions of records in a broad range of formats from books to multimedia. The Online Computer Library Center, as a co-operative of 50,000 libraries and research organizations, produces and maintains WorldCat with 50 million records in 400 languages.